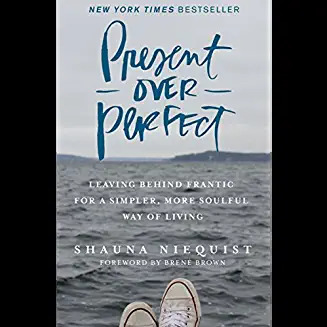 The author, Shauna Niequist, uses stories, poems, everyday language to describe what has changed in her life. She was basically a go-getter, type A, nonstop action type of person. She worked hard, played hard and had little time to stop and think about where her life was going. When she did stop, she realized many things she was unhappy with that made her slow down and take stock of her life. One of the stories left an impression on me. The chapter is called The Man in the Tuxedo. It is about a man who was dying of cancer and left a video of himself to his family and friends. The video of this man wearing a tuxedo and giving a toast would be played at his adult children’s weddings as his way to toast them even if he wasn’t alive. At the same time, the author herself, Shauna, was going through a situation in which she had to make a big decision regarding taking on an opportunity through work. Shauna had asked for advice from a friend about whether she should take the opportunity or not. The friend then showed her the video of the man in the tuxedo. Shauna then realized that the “opportunity” she had worked for for so long was just more work in disguise. She declined the opportunity and was told graciously that another project was waiting for her if and when she wanted it. Her relief at knowing that she hadn’t obliterated her career as well as knowing she could be home more with her family was something of a turning-around of her life and priorities. The man in the tuxedo taught her that, in the end, her family and people closest to her were more important than working more and harder. I almost feel like I need to make another disclaimer – this book isn’t about everyone quitting their jobs or not saying yes to opportunities in life. It is about knowing what you really want out of life and making sure you’re on track with it. It goes along with my tagline and motto – Make Room in Your Life for What Really Matters. And that is why I not only declutter and organize people’s homes, cars, offices, etc. but I want to know what matters to my clients because those are the things that they should hold on to. Everything else is just shiny or new or fun-for-the-moment or a gift you can’t bring yourself to get rid of. Everything else really isn’t important when all is said and done. We can’t LOVE everything. That is reserved for only the few truly special things in life.